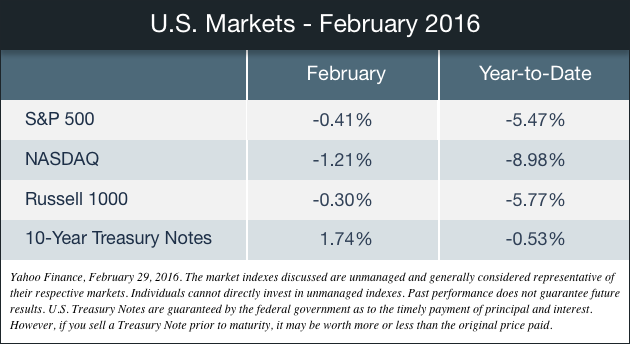 Stocks turned in a mixed performance in February as oil prices continued to dominate trading throughout the month. Some attention also shifted towards global monetary policy as the central banks in more countries adopted negative interest rate programs. The Dow Jones Industrial Average moved 0.30 percent higher, while the Standard & Poor’s 500 Index dropped 0.41 percent and the NASDAQ Composite slid 1.21 percent. The markets began the month on a down note as oil prices and China economy weighed on stocks for most of the first two weeks of trading. Market sentiment took a positive turn by the end of the second week thanks to a strong retail sales number that indicated surprising strength in the U.S. economy. Carrying the momentum over from the previous week’s late rally, stocks extended their gains despite fresh declines in oil prices. Energy stocks soon joined the rally as a handful of oil producing nations, particularly Russia and Saudi Arabia, announced a preliminary agreement to freeze output, with signs that Iran might sign on. Stocks continued to move higher in the final week, overcoming weak economic data emanating from Europe, the U.S. and Japan. This decoupling from economic data was extended to China, where a sell-off in Chinese equities failed to drag down U.S. stocks. The decoupling, however, wasn’t complete as oil price fluctuations maintained their sway on the market. Every sector of the S&P 500, except for Health Care, ended higher for the month. Leading the charge were Materials (+10.92 percent), Industrials (+7.15 percent) and Utilities (+5.58 percent). Also closing with gains were Financials (+0.57 percent), Consumer Staples (+3.65 percent), Consumer Discretionary (+1.77 percent) and Technology (+2.38 percent). The Health Care sector was down 1.25 percent. 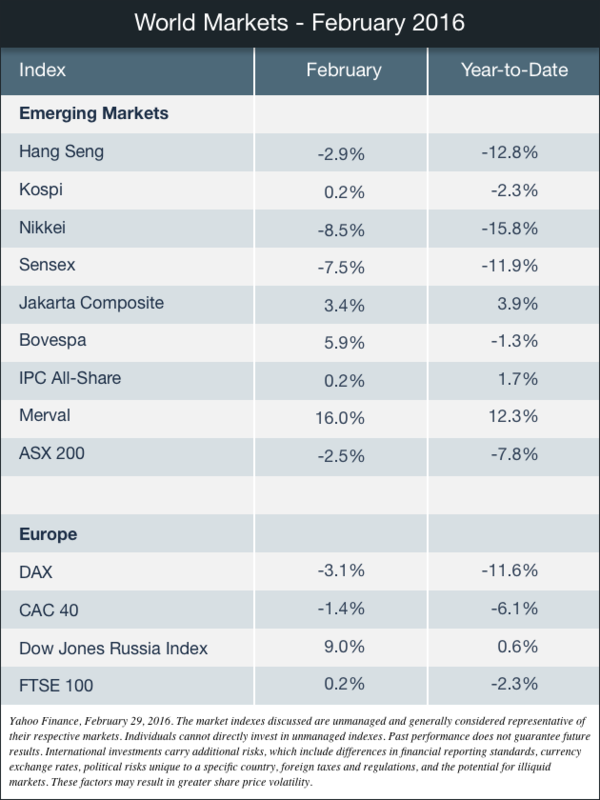 Markets overseas posted another negative month, with the MSCI-EAFE Index losing 2.10 percent. European markets retreated as weak corporate earnings, feeble economic reports and uncertainty about Britain’s exit from the European Union drove investors to the sidelines. Major markets such as Germany, France and the Netherlands each experienced declines, while Belgium, Italy, Portugal and Spain suffered more substantial losses. Market in the Pacific region were mixed as Hong Kong dipped while Indonesia rose. Meanwhile, Japan and Australia were lower. Gross Domestic Product: Economic growth was revised higher, posting a 1.0 percent gain versus an earlier estimate of 0.7 percent. The revision showed slightly weaker consumer spending, but a substantially less inventory investment decrease. Retail Sales: Consumers bucked the tide of global economic worries and falling stock prices as retail sales rose 0.2 percent in January, while December’s number was revised to a 0.2 percent gain, a reversal from the decline initially reported. Industrial Production: Powered by auto sales, U.S. factories increased production by 0.9 percent, posting one of the sharpest jumps since the recession ended. These reports can be volatile month-to-month as evidenced by December’s number, which was revised from a decline of 0.4 percent to 0.7 percent. Overall capacity utilization rose 0.7 percent to 77.1 percent, a level that points to continued economic sluggishness. Housing: Construction of new homes fell for the second straight month, declining 3.8 percent from December. Existing home sales rose 0.4 percent, making January the second-strongest month of sales since 2007. This sales pace was also 11 percent higher than the previous January. While the data show that the housing recovery continues, new home sales illustrated how choppy that recovery is, beginning the year on a weak note by posting the slowest sales pace since October—dropping 9.2 percent. CPI: Though prices were unchanged in January, the consumer price index for the last twelve months rose at the fastest pace since October 2014. Core prices (i.e., excluding food and energy) jumped by 0.3 percent, the highest monthly rise in more than four years. Durable Goods Orders: New orders for durable goods rose 4.9 percent, a relief from the pounding U.S. manufacturers have endured from a strong dollar and a weak global economy. December’s 4.3 percent decline was revised to a 3.7 percent fall. In testimony to Congress on February 10th and 11th, Janet Yellen voiced concern that stock market declines and higher interest rates for riskier borrowers could suppress economic growth, putting the course of future rate hikes into question. Yellen reiterated that the Fed would keep a watch on global financial conditions and any future rate hike would be data dependent. The minutes published from January’s FOMC meeting revealed members’ concerns about the global economy and turbulence in the financial markets, leaving the path of any follow-up rate hikes unclear amid the increasing uncertainty in economies here and abroad. There is approximately $6 trillion of global government debt that currently have a negative yield. The pressure for the Fed to follow suit has become sufficient enough that Janet Yellen felt the need to address this issue in her February testimony to Congress. Despite having just raised rates in December, Yellen told lawmakers that she was not closed to the idea, even if she had questions about the legal latitude for her to do so. The objective of negative rates is to spark economic growth that remains stubbornly tenuous by encouraging banks to lend, while relieving consumers and businesses of debt burdens that may restrain consumption and investment. In theory, negative rates should be a positive for stocks, though theory can take its lumps when played out in real world markets. Negative rates have certainly proved to be a significant challenge for banks. They may also have the effect of fostering the perception of a weakening economy, inducing cutbacks in spending that could make it a self-fulfilling prophecy. Negative rates are also a big disadvantage for savers since they can make little-to-no money on deposits held at banking institutions. A landscape of predominantly negative rates is an unprecedented experience. While its outcome is unknowable, investors may want to watch how these policies impact economies and the markets in the months ahead and whether the negative rate bandwagon grows.